I am so sick of kale. Good thing I taught my family to like chard with this world famous dish. Well not world famous, but famous in my house. I love chard. The second I saw the rainbow-colored stems at farm camp growing in a garden with beautiful fluffy green leaves I knew that they would taste good. One morning I bought then at the farmers market. Later though, when we brought it home, I had no idea how to cook it. My dad started cooking the chard in a pan and putting red pepper on it. I took a taste, but it was a bit spicy, so I added some soy sauce to make it salty and to balance the spicy-ness. Then I tried it again, and it tasted really good, but it needed some sweetness. Finally I thought of the perfect solution: Rice Wine vinegar! (Mom’s note: seasoned rice wine vinegar!) I drizzled it on and sampled the chard. It was delicious! I put the whole thing into a bowl and honestly could not stop eating it. By the time it was dinnertime there was only half the amount I had cooked left in the bowl. Since that dinner, I make the recipe very often and every time it tastes even better. Her mother would also like to let you know that this entire dinner can be made in 2o minutes, 15 if you have a 10-year-old sous chef taking over the chard. Add olive oil to a skillet over medium heat. Add onions and red pepper flakes and cook until onions get soft, about 2 minutes. Add chard and cook until just wilted. Drizzle in soy sauce and vinegar and serve with steak and crusty bread. Abby’s recipe book. Also includes classics such as: Homemade Butter, Romaine Salad, and Fried Flounder. Darling post Abby, thanks for a fun and new idea! P.S. I’m over kale as well 😉 It’s so…..2012. I am curious about leftovers, do you think reheating the chard would be a disaster? I don’t think I’ve tried to reheat something leafy and wilty (totally not a word). @kimbo – I don’t know about reheating leafy wilty greens — I think they’d probably too soggy. I’d just as soon eat them right from the tupperware container, cold. Or just use drop them into an omelet or mix into grains for a side dish reprise. Thanks Abby (and Jenny) for showing that it’s the kids who are the future cooks of the world! I’m also a huge fan of rainbow chard – well, actually rainbow anything 🙂 . I grow tons of it in my garden every summer. I love how you created a balance of salty, sweet and spicy with this recipe. Looks awesome! Abby, I agree with you that I love chard! However, it just doesn’t sell well for us at Farmers Markets. I wonder if that’s because people just don’t know what to do with it? 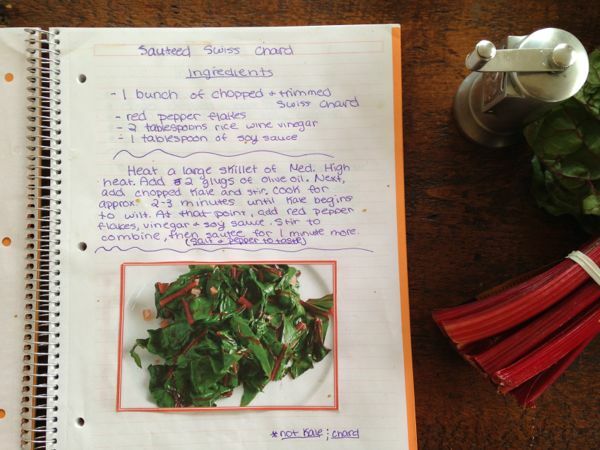 Would it be ok if I shared your recipe with customers that are curious about chard? Thanks, Abby! I’ve been trying for ages to come up with something clever for Swiss Chard. A gorgeous veggie deserves a delicious recipe and yours shows all kinds of promise. Can’t wait to give it a whirl this week for a special dinner with friends. Cheers! Also over kale! I shy away from chard b/c i think you are supposed to first saute the stems, then the leaves…and that just seems to complicated when i’m looking for a quick saute. did you saute them all together? Abby, you are making me hungry! 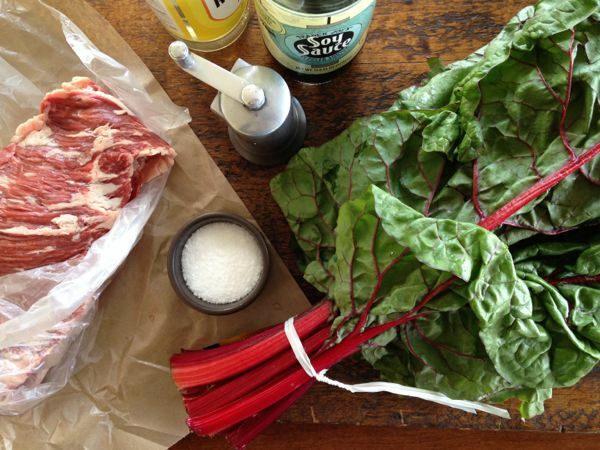 I love chard too, and your recipe sounds so perfect with the steak and crusty bread. I’m buying groceries to make it next week! 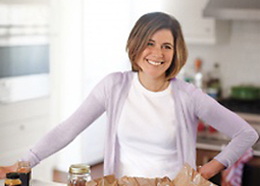 Keep cooking, and share more of your recipes on your mom’s site! Chard is so much yummier than kale. Thanks for the recipe Abby. 1. I eat swiss chard plain. I think I’ll like it your way even better since I love vinegar and soy sauce. 2. I see we have the same pepper grinder. I am totally going to try this out with my husband. He has been anti chard lately. I am not over kale, but I love chard, too. This is a great recipe; I love sautéing greens rather than steaming or boiling them. The taste is just so much more flavorful. Thanks for sharing Abby! While I’m not over kale just yet, I think my 3 year old and almost 6 year old are. I think they’ll love trying a new recipe knowing it was written by a young chef such as yourself. Your recipe sounds so flavorful and satisfying. And your penmanship is so neat! Thanks Abby. Your chard looks like it ROCKS and I’m gonna try it this week for dinner. You should make a cookbook too, my dear! Just made it! Thanks for the tasty idea. Loved Abby’s post! I am not tired of kale (yet), but have yet to try chard and this post makes me want to do so ASAP! Just a quick question though. What is the difference between rice win vinegar and seasoned rice wine vinegar (other than the word seasoned)? I use the kind I find at my grocery store, the Marukan brand (here: http://recipes.wikia.com/wiki/Rice_vinegar). Would that work for this recipe? Thanks! We had a bunch of rainbow chard in our box this week. All princesses love rainbow food. I love chard and have never really learned to like kale. I still try. 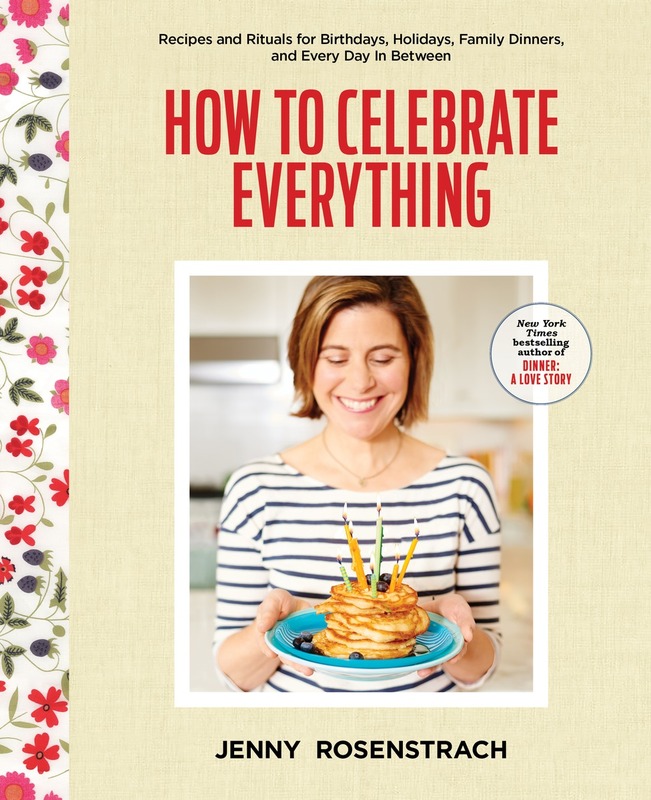 Abby, this is a great recipe and I think your cookbook is simply wonderful. You have good penmanship (an old fashioned term for handwriting) too. Keep up the good work! We literally inhaled this! So good. Thanks, Abby! 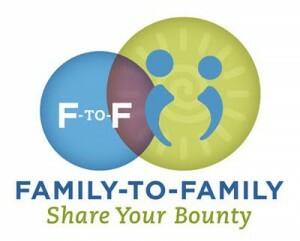 I shared with our CSA crowd. Great recipe and delicious Abby!